Yup that's it!! A banana and 2 eggs! Mash up the banana, add the eggs and beat (I just use a whisk). I also added a teaspoon of cinnamon but that's entirely up to you! Heat a pan on high (My oven goes from 1 to 6, so I use setting 5) and add about a teaspoon of butter. This acts as a non-stick agent, so after every few pancakes you do, add some more! 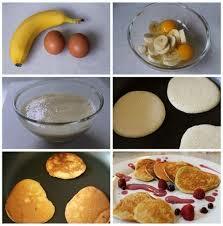 Use a table spoon to spoon on the batter making as many pancakes as you can fit (4 or 5 usually). Let them cook until you see little bubbles forming, then flip them. These pancakes are a little more delicate than the standard ones so be 'flipping' careful ;) Once the other side is done, SO ARE THEY! Very easy!! For something more special you can also make Red Velvet Pancakes! To make these all you have to do is add about a tablespoon of red food colouring and a little less than a tablespoon of cocoa powder to your mixture. You can also throw in a dash of vanilla essence. 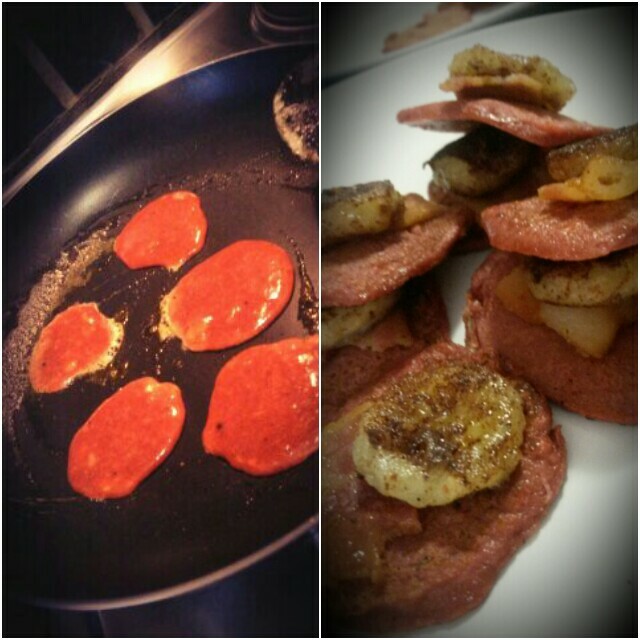 To serve, fry up some crispy bacon and some fried banana slices (sprinkle cinnamon on them before you fry for extra yumminess). Layer with the pancakes and voila! For a sweeter option you could use cream and some berries of your choice. There are so many options really!